A virtual dog could soon be used as an educational tool to help prevent dog bites, thanks to an innovative project led by the University of Liverpool’s Virtual Engineering Centre (VEC). In collaboration with Dogs Trust and University of Liverpool animal behaviour researchers, the VEC has created a proof of concept virtual reality (VR) experience in which people can approach and interact with a dog displaying signs of aggression in a safe and controlled way. The experience aims to help adults and children recognise specific behaviours displayed by dogs, which could potentially lead to an attack or incident if not correctly identified. 6,740 hospital admissions for dog bites and strikes were recorded in the UK in 2013 and University of Liverpool research suggests that the burden of dog bites is considerably larger than those estimated from hospital records. As part of a desire to better educate children and adults about dog bite prevention, Dogs Trust wanted to explore whether a digital tool could help people identify a range of stress and threat behaviours typically exhibited by dogs, which have the potential to lead to a bite. In response to this challenge, a team animal behavioural specialists and psychologists from the University worked closely with the VEC to make certain that the body language and detail shown in the virtual environment was both realistic and a truthful reflection of real-world canine behaviour. As the user approaches the dog, the behaviour and body language of the dog gradually changes, the dog’s behaviour begins to display signs of aggression including licking its lips, lowering of the head and body, front paw lifting, growling, and showing of teeth. These behaviours are referenced from the ‘Canine Ladder of Aggression’ which shows how a dog may behave when it does not want to be approached. Iain Cant, VEC Visualisation Team Leader said: “This was a really interesting project to work on with a lot of exciting potential for the future. In the aftermath of the Christchurch 2011 earthquake, officials had difficulty identifying the status of dogs at civil defence centers. If you were the owner of a disability assistance dog, this made things more difficult in what was already a stressful time. 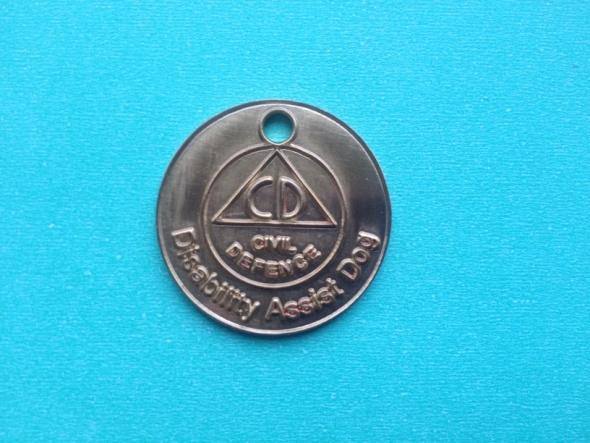 In December 2013, the Minister of Civil Defence, the Hon Nikki Kaye, announce the production of a Disability Assist Dog tag that will be officially recognised throughout New Zealand. The tags will be entered into the National Dog Database and provide unique identification for each dog, linking it to its owner/handler and the organisation that certified the dog. These tags will be help match lost dogs and owners much faster and ensure that handlers and their dogs are allowed entry to official civil defence centers. What programs are in place in your country to support owners/handlers and their assistance dogs?